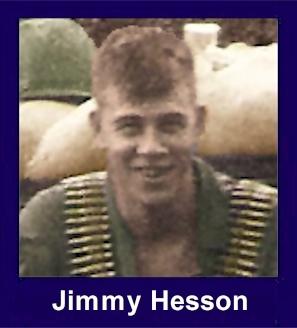 The 35th Infantry Regiment Association salutes our fallen brother, SP4 Jimmy Dale Hesson, who died in the service of his country on January 21st, 1967 in Binh Dinh Province, Vietnam. The cause of death was listed as Small Arms/AW. At the time of his death Jimmy was 20 years of age. He was from Lafayette, Tennessee. Jimmy is honored on the Vietnam Veterans Memorial at Panel 14E, Line 63. The decorations earned by SP4 Jimmy Dale Hesson include: the Combat Infantryman Badge, the Purple Heart, the National Defense Service Medal, the Vietnam Service Medal, the Vietnam Campaign Medal and the Vietnam Cross of Gallantry with Palm Unit Citation. Around January 19th/67, I went on R&R to Bangkok Thailand for 5 days. Jimmy took over the M-60 while I was gone. When I returned to my unit Several of my comrades had been killed, Jimmy was one of them. When I found out Jimmy had been killed in action,I went Beserk. I cannot express in words how I felt about Jimmy. He was the best friend and combat buddy I ever had. I recently talked to Jimmys younger brother in Tenn, he is sending me a picture of Jimmy that I will have posted on this site. If any of Jimmys Family or Friends want to contact me, please feel free to do so. Jimmy and I were the same age, only 11 days difference. I Pray for the Family of this Brave Hero. May my Fallen Brother Rest in Peace. David Braswell A/1st/35th/25th.